The paradigmatic conflict between the direct winning of energy at the one hand and the existing transformation of raw materials in association with the secondary sustainable technologies at the other hand has a long history. The conflict resulted in the destruction and repression of the work of early pioneers in this field like Nikola Tesla (1846-1943), the inventor of the alternating current, and Wilhelm Reich (1897-1957), who made several discoveries in this line of research (see also the article on Einstein, the ether and relativism at this site). 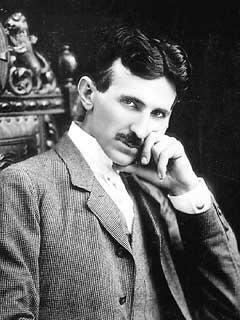 After the death of Tesla were his papers confiscated by the american government and kept secret because one didn't want his inventions in the field of weapons technology to end up in the wrong hands. And with that action were also many of his inventions meant for the civil society and inventions which could be important for the development of free energy technology relegated to the darkness of ignorance. Already during his lifetime had not only Tesla great difficulty to keep the status of and financial support for his work with the increasing eccentricity of his inventions, but had also Reich troubles with his invention of orgone energy - the name he gave to free energy - about which he had consulted Einstein. Einstein had rejected him with the message that there were alternative explanations to be found, but without him willing to continue with the investigations. Nevertheless had Reich irrevocably proven, against the second law of thermodynamics, that organic material by nature has a slightly higher temperature than inorganic material. With that difference one then had the proof of his orgone energy. Also people like Viktor Schauberger (see video) (1885-1958), and John E.W. Keely (1827-1898) were not taken seriously because of their energetic interpretations of the force of the ether, of which we now understand that it had to be the dynamical force of the relative ether the way Einstein stated it later in his career. Since Einstein had a shift of paradigm taken place away from Newton and Maxwell in which scientists no longer could accept such superseded ideas of the ether as a uniform substance as being the correct presentation of the state of affairs in nature. The concept of ether turned out to be a bit more complicated thus. The concept of the ether should not have been abandoned though but had to be reassessed, and that is what Einstein finally in 1920 did in public in a lecture in Leyden, The Netherlands, where he clearly spoke in defense of a concept of ether which is based upon the physical properties that unmistakably are attached to the reality of space. Matter, time and space can factually not be considered as separate things. They define each other. This change of mind of Einstein meant an enormous shock for the science of physics and lead to a great divide among its members, a divide which the science has never managed to overcome (see also Kostro 2000). 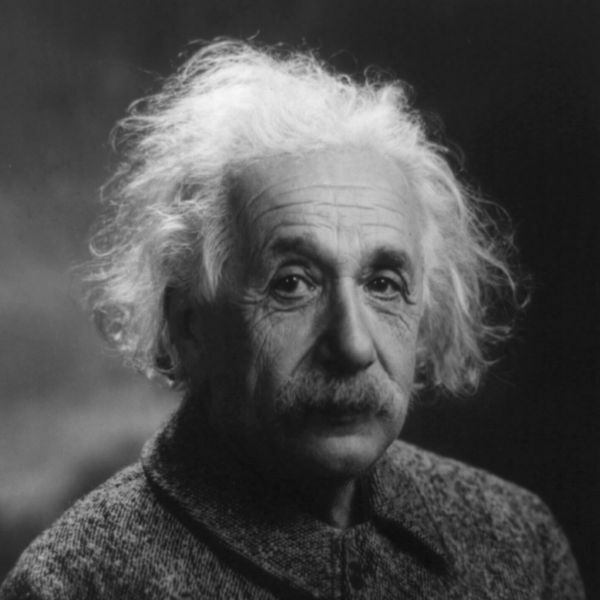 Nevertheless is at present of all the ether theories (aether theories) the so-called Ae-theory of Einstein the one most popular among physicists. In this theory is one since the eighties of the twentieth century playing with the notion of a universal concept of time and a fixed frame of reference in space which is at odds with the so-called Lorentz invariance; it amounts to the fact that one is meddling with the dogma of the in all directions invariant speed of light which constitutes the basis for the theory of relativity. In fact converted Einstein with the revision of his ether notion and turned he back to the classical theories of the universe that assign the ether an all-important place in creation, be it that he now considered also the ether as relative, as a form of space depending upon material characteristics. Of course can only be spoken of progress when the new way of thinking of modern physics encompasses the old way, and not so much when one tries to reinvent the wheel of the classics with a lot of ego. A 'theory of everything' contains of course also the truth of the past. Nikola Tesla in the New York Times of 11 July 1935 said about Einstein's descriptions: "magnificent mathematical garb which fascinates, dazzles and makes people blind to the underlying errors. The theory is like a beggar clothed in purple whom ignorant people take for a king..., its exponents are brilliant men but they are metaphysicists rather than scientists.." (see wikipedia article). Einstein is not as concrete and clear as an ingenious and original inventor and engineer specialized in practicable thinking als Tesla would like. One doesn't all of a sudden have a 'new theory of everything', an integer paradigm. And Einstein's notion of a relative ether was also not something new either. His 'new ether' can be retraced to the vedic culture of India which we, especially from the Hare Krishna's, learned to know since the sixties of the twentieth century. Therein is the ether divided in three, in other words: considered relative. Vedically one speaks of three Vishnus who each represent another part of the ether (cosmic, universal en local). Also the esoteric philosopher Rudolf Steiner (1861-1925), a contemporary of Einstein, spoke of a relative ether: the expanding warmth ether and the light ether as opposed to the contracting chemical or sound ether and the life ether (with to the left pictured the respective symbols). History teaches us that repressive progress, progress in which previous developments are entirely denied, repressed and forgotten, leads to a serious obstruction or else collapse of the civilization in question. The roman empire e.g. has, as a culture, as a time system directed to the order of the moon, in about two steps abolished itself: first was by Julius Caesar 45 B.C. the lunar calendar abolished and replaced by a solar calendar, and next was the order of the week that was projected upon the solar calendar, but still knew its traditional lunar division, for practical reasons (the market) for the civil population abolished by Constantine the Great in 321 A.D. The correspondence with the moon (in so-called Ides, Nones and Kalends) was at the time definitely replaced by the linear, not leaped order of the week that was introduced by him (for the monasterial rule was it by the Christians maintained till the end of the Middle Ages). Little more than a hundred years after Constantine introduced the linear week, stormed the barbarians the administratively and culturally completely eroded city of Rome to be plundered by a so-called 'primitive' barbarian culture directed to... indeed the lunar calendar! Also Islam managed in the seventh century A.D. with its prayer times to the sun to put a foot in the european cultural doorway of linear weeks and is up to the present day in conflict with it (as well with itself as with the West). Repressive progress at the cost of that what historically preceded is thus no real progress at all but a compensatory phenomenon. There is renewal, but the synergy does not improve: it crumbles only further away. With the ego of the renewal is easily the continuity with the past broken, with the old regime, and thus is one losing one's integration and falls the culture down. A common culture (or order of time) can factually, if one wishes to keep it in a working order, only be expanded upon, one e.g. adds such a complication as a solar calendar or linear week to it, but the inheritance of the thereto belonging culture of the lunar calendar preceding can't just like that be erased from the collective memory or the (genetically programmed) consciousness of the natural reality. If one nevertheless tries to do that, is one in that case grossly underestimating the power of time conditionings. Within a culture is a certain continuity needed when one doesn't want to speak of a fall down of that culture. Old mistakes and imperfections must thus be understood and remembered the way one also commemorates wars, and cannot be repressed just like that just to get rid of the old misery. The free energy researcher Peter Lindeman states relating to this: "In this society, theoretical science has been elevated to a very high level of prestige. Under this system of belief, the real needs of humanity have not been well served. It is time that these incorrect theories be carefully examined and discarded, so that experimental science can once again take the leading role in defining the nature of physical reality. Only then will Etheric Science be free to offer its bounty of solutions to a desperate and waiting world." History will repeat itself if we haven't learned from it, if we don't remember what went wrong. The later Julian calendar e.g. needed a correction in the method of leaping in order to accord with the classical play of forces of the ether, but the calendar shouldn't in its entirety have been abolished, the way the pope it at the end of the Middle Ages did for the monasteries. To be aware of repression is something we learned later on from the behavioral science, or art, of psychoanalysis. The unconscious is an enemy facilitating a sudden change of culture or a break of paradigm, a change which because of that same enemy of not being conscious is also dangerous: on the personal level we e.g. may remember it from the popular song with the text 'suddenly he was not the man he used to be' the way the Beatles sang it in 'Yesterday'. Just as a breakdown can change an individual human being completely overnight, is also a war on a collective scale capable of changing people no-time into zombies who no longer understand matters, who are out of touch with their past and change into animals. The psychiatrist calls it decompensation of the ego: the performance of control can no longer be kept up. 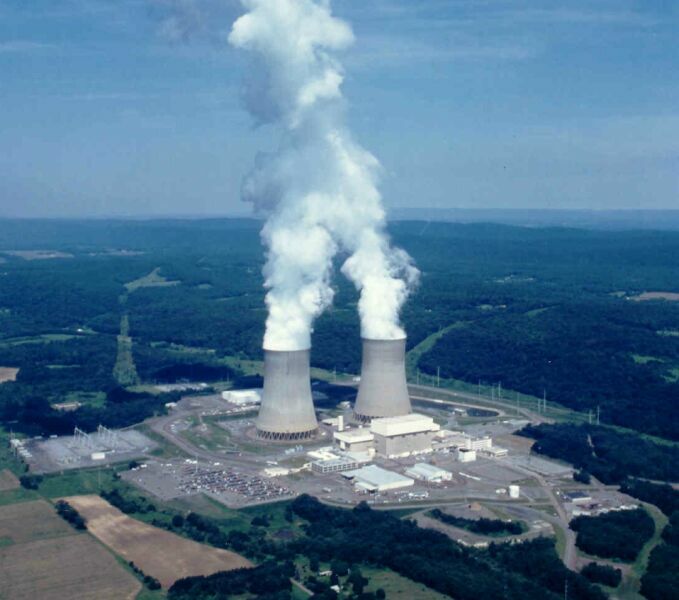 The present established, 'classical', indirect method of winning energy based on coal, oil and gas, which felt threatened by the energy innovators and inventors, has till the end of the twentieth century, till very recently thus, been very repressive and destructive. That has not only resulted in many a personal and scientific drama, but has also contributed to an obstruction of the progress that mankind needs in order to survive on this planet, we now begin to realize. On e.g. the webpage PESwiki-suppression and in the Lightworks documentary Tesla and the race to Zero point energy are many cases discussed. One of the best known is the suppression of Tesla by his financier J.P. Morgan who cancelled e.g. his entire Wardenclyffe project of free energy for the entire planet because it couldn't generate any income. The repression of this kind of inventions as well as the traumatized paranoia about the free energy suppression1 associated with it, can no longer be maintained, even though the danger of some inventions indeed mustn't be underestimated and may justify a certain secrecy. For this kind of secrecy developed Tesla himself e.g. a complex procedure about the proliferation of a weapons system of his in which he diminished the risk of possible abuse as much as he could by dividing the knowledge in question over several governments of the countries in the world: it would only work if they would cooperate. The threat of a total collapse of the culture and the thereto belonging world peace, the danger of decompensation as the psychiatrist calls it, with the repression of the inventions in the field of the direct winning of energy, is just as well a clear and present danger. A stressed culture may give an odd response. For a long time one may compensate for a lack of knowledge and skills, with nice movies on television e.g., but these compensations are but a surrogate of course, in the end there is only the possibility of a new culture when the essential knowledge thereof is shared and handed down in the educational system. Keeping people ignorant one creates a sub-class with the size of the base of a pyramid relating to the top, and thus having created has one that way arrived at an inequality of citizens which sooner or later, violent or not, will result in a reaction like it concerned something determined by a law of nature. The way gaseous molecules mix into a homogenous mass, can also the equality among people in the field of knowledge not be stopped. Thus must we take care not to throw away the child of the continuity, the soul of the culture, away with the bathing water of renewal and innovation. And it indeed seems to be so that we collectively will have to change our energy policy, whether we like it or not. For the resources used in non-sustainable energy are getting depleted and the limits of what our environment can bear are reached. The indirect, renewable form of winning energy keeps demanding for a greater efficiency, which refers to a more direct method of winning sustainable energy. We simply have to thus, however attached we are to the old order of the secondary policy of winning energy. For the same reason of in the future having to be vegetarians because the production of meat is simply a very inefficient way of producing proteins which cannot be maintained with increasing numbers of people on the planet, must we also let go of the old policy of winning energy and the thereto belonging economical and geopolitical strategies. We therefore have to expand our view with the extra concept of a primary way of winning energy and thus correct our relativistic paradigm with the 'absolute relativity' of the order of the primary energy in the universe. The repression may not become a decompensation but must, politically correct, more or less therapeutically, in a psychologically responsible manner be guided towards a revaluation of the by many a 'modern' scientist so very much despised concept of ether. And in that case play as well the new inventions a part as the notion of a second 'converted' Einstein who later on in 1920 said that he had been too 'radical' in his rejection of the ether as being a superfluous and out-dated concept1. We are simply driven by the force of evolution to which we all, as energetic, ethereal, living beings are subjected. We are dealing with a compelling force of nature that is mightier than the individual decision of single persons, national governments or supranational, financial interest groups. 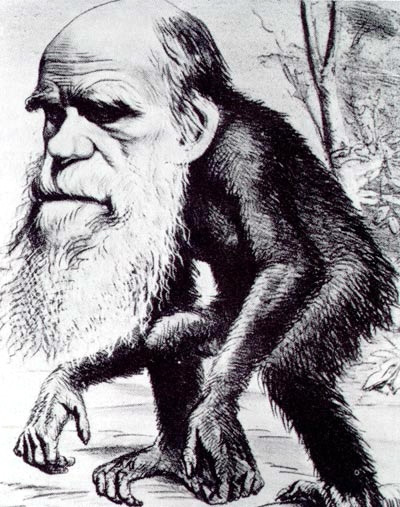 And that evolution followed probably quite a different course from what we always have thought it would have with Charles Darwin. Modern skulls have been found in layers of petrified sediment of millions years old and next to traces of dinosaurs have been found just as old fossilized foot prints of modern man2. The ruling paradigm always represses the anomaly - or the invention of an alternative technology of winning energy in our case - and the new paradigm will have to integrate that knowledge. The new energy suppression is thus not so much a matter of evil minded persons, institutions or administrations, but is more an intellectual problem of a paradigmatic revolution. One has to grasp it, drop out and then switch over to it. Only if a majority does this has the new paradigm arrived. Till that time is everything of it joyously ridiculed. It is the way the philosopher Schopenhauer (1788-1860) said it and after him also the psychoanalyst S. Freud and the SF-author Arthur C. Clarke: firstly one is ridiculed, then one is opposed and next is one accepted as if it concerned the most common thing in the world (see the quotation at the beginning). It is a known mechanism of which many writers and artists can testify. To be acknowledged, takes some time, and that is thus also true for a new technology. Nature commands us how to behave, viz. to be adapted to time and circumstance, and the same way command our genes us as well as the culture does we have developed with it. To evolve, also culturally thus, is more an established fact, a cosmic necessity, a need which in all her effects of refinement and improvement of adaptations must be retracable in all the worlds of living, and thus also on other planets if we could visit them. The often from the side of the government classified investigations about UFO's, extraterrestrial life, that is to say extraterrestrial human, humanoid life and human civilizations, point always in that direction. Among scientists there is no doubt that extraterrestrial life with a high degree of civilization exists (see e.g. the Drake-equation). The problem is more in delivering the proof, or better stated, in the repression of the proof we have. More and more is there in the past couple of years (2005-2007) from the side of the (american) government, from military organizations and the scientific community an increasing openness. The proof that such an intelligent, highly evolved culture is observing us, was in the past kept away from the public, if necessary with disinformation, intimidation or worse measures, in order not to disturb the common man and to prevent that one as a government would be faced with unwanted civil initiatives and collective psychological problems. One doesn't want to be embarrassed with the then inevitably rising demands for control and action one administratively and scientifically cannot immediately answer to. It is for everyone an uncharted territory. But it is also true that we in the context of our subject mustn't just look away from extraterrestrial phenomena. In that context are we namely faced with an alternative and undoubtedly much more civilized, energy policy and a better form of self control of not just the individual, but also of a better science and culture of living together in relation to gravity and moving through time and space. In that sense can the energy question not be regarded separately from our concepts of space, the order of time, the forces of nature, elementary particles and the existence of more dimensions than the three or four we acknowledge at the moment. Let us therefore first delve deeper into that what we have witnessed to be true for our extraterrestrial visitors, for we are more conscious then of where we are standing ourselves and what remains to be done by us. We learn through observation, after first, very socratically, having accepted our ignorance, and mustn't assume that we will learn anything if we turn away from matters like these. It takes courage, but it is also very scientific, not to jump to conclusions immediately but simply admit that there might be something we do not know. How else may one discover anything? About extraterrestrials and the energy politics associated with them has been produced a nice documentary called: UFO: The Greatest Story Ever Denied by Joe Escamilla. Therein he answers the question how and why the american government, or in fact a shadow government of national and international institutes, have kept UFO's and their free energy technology a secret for the wider public. There is mention of a group of people, of whistle-blowers from within the governmental institutions in America, who stepped up to act against the secrecy: the UFO Disclosure Group (see also disclosure.net and some dutch pages). In May 2001 they gave a press conference and posted they on Google video's with testimonial accounts (zie Video's 1 &2). The present chairman is named dr. Steven Greer. He has a site named AERO. Another well-known protagonist is Stephen Basset of the exopolitics Paradigm Research Group. These people state that humanity is suffering too much damage from the for political and economical reasons, in combination with billions of dollars consuming so-called z.g. black projects (see the video Billion Dollar Secret), keeping secret among other things the knowledge already available of energy systems of an alien origin. With this knowledge are there, based on reverse engineering of crashed UFO's and contacts with aliens themselves, already by human beings manufactured ETV's, or extraterrestrial vehicles, like the TR-3B secret USAF craft. Also have free energy technologies been classified. One may be referred to the words of the hacker Gary Mackinnon (site, wiki, pagina, blog, interview), the Google video presentation: The Case for Antigravity, an interview with the Area 51 specialist Edgar Fouché, the testimonies of physicist Bob Lazar (video 1&2), the ex-Majestic 12 collaborator the microbiologist Dan Burisch (video, interviews; page's, site, info) and a lecture of Stan Deyo (site, book). But the truth can despite of all the secrecy not be stopped in this inevitable cultural evolution towards a greater planetary, humanoid awareness. Countless patens have been awarded the last hundred years concerning UFO-technological inventions. The researcher Luke Fortune bundled since 1997 in five thick volumes 3200 pages of descriptions of 260 patents of replicable designs (see e.g. the U.S. patents 3774865 en 10074934). There are also designs from the Nazi-germany era in which one tried to use this technology to obtain military superiority. The Germans, who forced free energy inventors like Victor Schauberger to work for them, called their prototypes 'rundflugzeuge', or 'roundcrafts'. Their term for space energy was 'vril-energie' and they called their prototypes Vrils (ranking up to number 8 see right picture) and Haunebu's (up to type III). Vril was a term in 1870 coined by Sir Edward Bulwer-Lytton in a book called Vril, The Power of the Coming race (pdf), an early science-fiction book of the victorian writer who also wrote The last Days of Pompei. The roundcrafts were pretty crude iron discs with a dome with windows, and the prototypes actually worked! (German site, pictures, s). In the next chapter we will see how the Nazi's who resented the 'american-jewish' science came up with a free energy device as well. Fortune states that the absence of applications of these inventions is mainly caused by the fact that the usual means of propulsion and the thereto belonging conventional ways of winning energy are more profitable. The initial impetus for the new paradigm is undoubtedly present in countless practically applicable forms, but the culture for it is simply not achieved yet. The internet is part of this paradigmatic development and runs in many respects far ahead of the other media, mainly because everyone may contribute, whether serious or not, and because of the fact that a documentary on the internet sinks in properly while on TV it by accident has to be recorded to serve as study material. More and more networks post their essential materials on the internet as we can see e.g. on their sites. On Google and on YouTube one can study countless professional and amateur movies of often vague, but sometimes also very convincing proofs of the UFO-presence and the matter of free energy. To begin with we would like to refer to four sensational YouTube movies from the UFO realm that raise doubts by many because they appear so real. In the next section will we further expound on the energy question. Of the following evidence has not been proven that is was faked. 2) A UFO very ceary visible with navigation controls above a small river in italy. 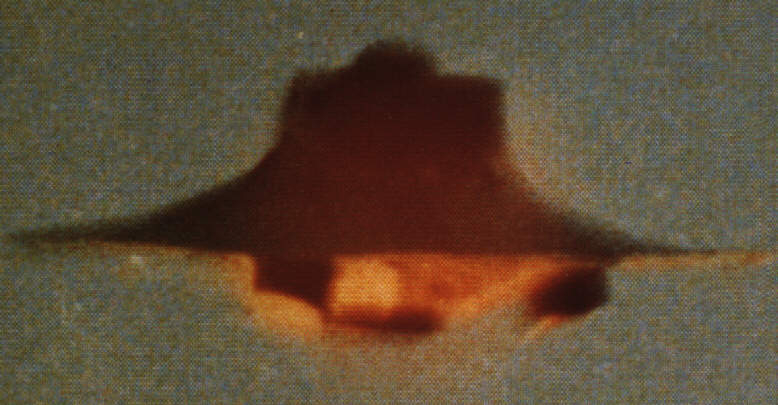 A clearly visible disc of three to four meters floats above a small river showing some technology of moving parts, after which it suddenly flashes away as fast as a bullit (see also a computer generated version of a similar group of UFO's pictured in Mexico 2007). 3) A challenging UFO viewed from a helicopter close to the former WTC-buidings - see also version2. A UFO of again a couple of meters wide shoots away from behind a WTC building and leaves behind, something which is very uncommon, a condensation trail. About a kilometer away it stops mid-air and then races for the helicopter from which everything is recorded. Just before it would hit the chopper the craft makes a sharp turn right in front of it to race away with lightning speed. 4) A UFO-wreck thousands of years old found on the moon during the Apollo 20 mission (video 2 - see also another discussion of other UFOs seen by NASA). Slowly with a scan of the lunar surface appears a peculiar vehicle in sight of the camera with a technical protusion like a cockpit on top and alien signs on the hull, as also meteor impacts on top of it. Comments: 'this vehice is in a bad condition, it must be here for billions of years'. Concerning the direct encounters with these extraterrestrial civiliations is there of the investgating journalist, the renown UFO-expert Jaime Moussan, a good video of a conference in Mexico to the occasion of incidents there, in which photographic materials of aliens, together with their messages in the form of the well known patterns in the fields, the so-called crop circles was discussed (see also our other article about this). Sgt. 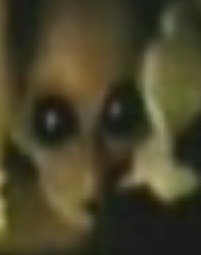 Clifford Stone (US Army) of the UFO Disclosure Group mentions 57 different species of aliens, of which some can be found onYouTube with photographs that escaped the control of governmental agencies (see also alienvideo.net). Next to that is there a documentary about UFOs in Russia called UFO KGB Secrets, presented by Roger Moore, which delivers very convincing proofs of the existence of UFO's and the secrecy by the russian government of (sometimes violent) confrontations with the interplanetary visitors, including an autopsy on alien bodily remains and photo materials of an in the region of Sverdlovsky in 1968 crashed UFO (thus independent of the Roswell-crash4). Also was there, believe it or not, beginning of 2007 a report of an interview with an alien 3 to be seen on Youtube which, as a top-secret of the government, because the copyrights would have been violated, was removed from the internet. Later on was it posted again though. The picture at the left is from that intervieuw. The existence of the being named J-rod (EBE-2) is confirmed by Dan Burisch, who did extensive biochemical research on it (see his declarations). There is thus no lack of evidence from even the most reliable sources. Within the UFO Disclosure Group there are witnesses from the NSA, FBI, CIA and all departments of the armed forces of America, who are often of the highest security levels within these world's most powerful and mighty societal institutions. One of the arguments they put forward is: ' absense of evidence is no evidence of absense', we musn't think that these phenomena are fabrications of hysterical people when secret services are keeping matters like these confidential. These people are willing to testify even under oath before congress of the irrefutable reality of this for mankind such an all-imporrant matter reaching far beyond what the public as yet has been allowed know. The spaceship on the moon that was photographed by the Apollo 20 mission. The as a consequence of conscious and unconscious processes blocking of the knowledge of such a humanoid reality of civilization and evolution, upon the reality of which we collectively ought to employ scientific reverse engineering and be of disclosure if we with a new cultural integration want to succeed in thinking along with it, can also be understood as being the result of a diseased mistrust held against mankind by a mankind which doesn't keep itself for incapable but for unworthy and inferior. We already for centuries have knowledge of UFO's and have an inferiority complex and a psychology of repression about it (see also ufoevidence.org and crystallinks). Faced with our shortcomings and inferiority in a certain area of interest - and why would that be true for spiritual matters by the way - do we tend to backwardness, false pride and self-destruction. Especially governments have a hard time psychologically to admit to anything of succeeding or failing in matters of this concern. 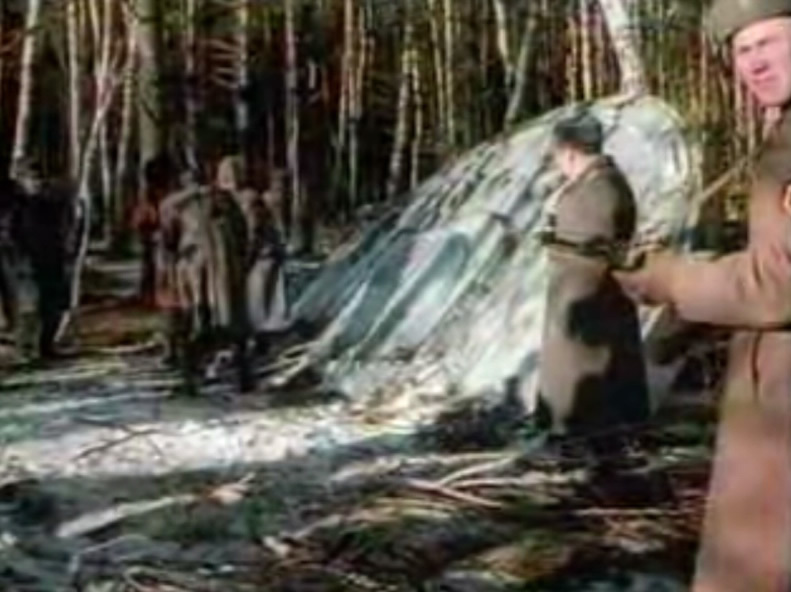 With experts like Stanton T. Friedman (nuclear physicist,see info-page) who regularly testify of the authenticity of the sightings, is in the documentary of the secrets of the KGB on these matters the following comment presented by mouth of the russian ufologist Tiurin Avinsky: 'we are simply not capable to cope with the knowledge and technology of such a fundamentally different paradigm nor able to copy any of these designs' (to the right a picture of the disc that was salvaged by the military in Sverdlovsky). One could just as well show a computer to someone from the roman empire. The extraterrestrials think in terms of traveling through dimensions, we in terms of traveling trough a three-dimensionally fixed reality. There exists, so it appears from the disclosures of the Disclosure Group, thus a tension between the knowledge kept secret and that what we publicly know at the moment. Witnesses testify of fully operational flying saucers of more than thirty meters wide that by us were copied. This constitutes a cultural conflict which cannot be maintained any longer if we want to find closure on the energy question. The paradigmatic conflict expresses itself time and again in the form of disbelief and even in the form of destructive reponses like declarations of insanity and accusations of fraud. One is referred to all the reactions of common folk on all the peculiar movies on YouTube. Many, with among them military people, air traffic controllers, pilots and normal citizens, lost their jobs because of spilling the beans about this matter and some even lost their lives with it. One must consider these victims of the repression to be heroes of our evolution. In this repression can collectively be recognized a psychiatric pattern of a schizoid and paranoid bordeline, politicized sociopathic ego; a conflict of a false, profit-minded control from the side of individual, fearful civilians and multinational corporations at the other hand who have themselves represented by governments that, outside of the democratic control want to pull the strings (in a military/industrial sense) with security levels ranking even higher than the one of the american president. The so-called. free energy supression conspiracy theories parallel to this are not just some unjustified suspicions based on individual failures that are held against governmental institutions and companies. It is a long standing festering historical phenomenon in which we at all cost want to defend and maintain our honor and control. It concerns a struggle in which mankind gives evidence of symptoms of what factually are evolutionary pains, growth pains in which not only individuals come to a fall and have to start all over with a new life, but with which in the past as known complete cultures fell down and rose again. It can be compared to an inverted mourning process in which step by step the new reality has to be accepted and the old way of thinking and repressively acting has to be given up. UFOs are vehicles originating from spaceborne civilizations that abandon their planet in a search for new worlds. There they willing or unwillingly inspire for a continuation of humanity and the development of a culture and offer they thus a completly different picture of evolution from the one we have cherished till now. They constitute a cosmic paradox: man abandons a planet to promote and sustain the life of man on the planet; and thus it will also be when we ourselves are etherborne. Their civilization flourished together with their planet. A flower blooms and whithers away. Thus it also fares with planets. But itself having sprouted from seed produces the flower more new seeds. Our human culture and the biological equilibrium here on earth is a flower and the ethermachine, the vimana as it in ancient vedic terms is called here on earth, constitutes, including the winning of energy from the vacuum belonging to it, the seed which leads to the flower meanwhile originating from it as well. Some propose that as a theory about our origins, one may differ in opinion on this, but as an actual practice of a cultural lead can the phenomenon simply no longer be ignored (see for instance the video's The Cosmic Plan and the stories of Jim Sparks (en 2 and article), Riley Martin (site) and others like Jaime Moussan who e.g. predict a major turning point around the year 2012). 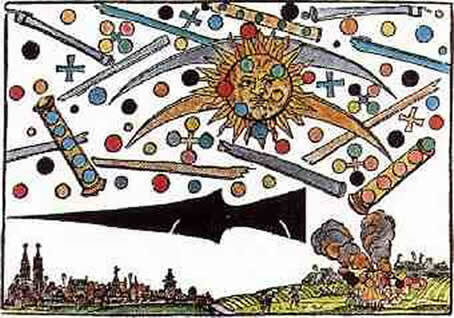 Many UFO 's above Nürnberg, Germany 14 april 1561. Hans Glaser woodcut from 1566, 5 years after it happened. There is much suffering, but still there is time. Believe that outside there is still the good. We are against fraud. The conduit closes upon itself." "Mind those who are making money: their misrepresentations of reality and their broken promises. One suffers a lot from this, but it is not a lost cause yet; keep believing that the good will prevail in the world. We turn away from deceit. The manipulation will backfire upon itself." The doubt about the authenticity of this message is even more opposed by the find of a message delivered earlier in the summer of 1991 in the form of a peculiar pattern in the crops of Milk Hill, Engeland. 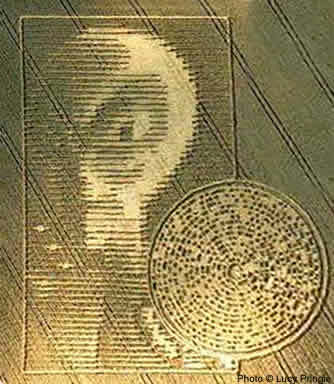 It appeared there as a response to a by tourists produced crop-circle with the invitation 'talk to us' (see also Colin Andrews in the Google video Alien Signs). The pattern turned out to be answering to all the demands that are scientifically formulated for circles to be counted as an authentic crop pattern: electromagnetic radiation, bent but not broken stems, etc. It was a message in strange letters that were analyzed as being ancient Latin and said: OPPONO ASTOS. Which means: we are against fraud. Whatever it may be concerning the authentic or inauthentic of the phenomenon, this is what the circle makers are after: to fight fraud. The physicist and philosopher of science Thomas Kuhn (1922-1996) demonstrated that historically one may speak of a conflict of paradigms the way we know them in a scientific sense from e.g. of the transition in our world view from the Ptolemeic view (geocentric) to the Copernican perspective (heliocentric). And also may we expect, with a new galactocentric way of thinking from the perspective of the force field of the universal ether and the winning of energy belonging to it, a struggle as a consequence of the natural evolution of our mindfulness. Such a struggle is necessary for individual persons as well as for entire cultures in order to adapt ourselves mutually as also adapt ourselves to nature and the pressure exerted by her evolution. It concerns a form of growth which is not just taking place in the field of science, but a growth which also will have its consequences in the fields of religion, politics and the economy. With that broad spectrum concept of growth in mind have we now with our story arrived at the point of the need for us to find out what in our culture can be found of inventions that were paradigmatically repressed. The labor of the inventors and their inventions that are partly destroyed and forgotten, or that are concealed by people with different interests, or else simply are not noticed, must be uncovered and exposed to proper public and specialist scrutiny. Many an inventor had to reconstruct his own work even or had to reconstruct the work of his predecessors that was destroyed. We have to apply reverse engineering on our own culture! How was Tesla proceeding and what did Reich exactly do? How does it all add up theoretically with the effects they all found? Of what remains after the battles of the paradigmatic struggles we may guess what in the past all has been discovered by ourselves. Are we able to recover from the damage we suffered from the scientific deprivation we ran into? The internet offers us new chances to arrive at an information-exchange and this pamphlet is so part of that endeavor. So, what have we found on the internet concerning developments and reconstructions of forgotten technologies, while the rest of the media couldn't keep up with it because of the uncertainty of the novelty and the preliminary nature of early stages? *1: Wikipediaabout free energy suppression: concerns the conspiracy theory raised by the trauma that one suffered in the paradigmatic conflict. The refutation of the theory is based upon the supposedly non-operability of the inventions. But the inventions have today 2008 for to a certain extend been replicated and already been patented as well in a number of cases.